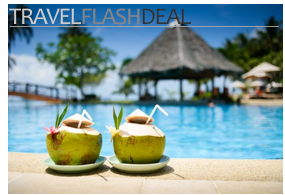 Travelers spend big money on upgraded airline tickets and medium money on upgraded luggage. Yet, for only a few extra dollars (or pounds or euros or yen or somoni) an upgraded experience can be had on an arguably more significant piece of travel gear: socks. Travel (save for the armchair variety) tends to involve a lot of standing and walking and being outside. And a surprising percentage of one’s physical comfort starts with one’s feet. For the previous few months Spot Cool Stuff has been trying out different socks; some were provided to us and others we purchased ourselves. The central take-away from this sock testing frenzy: Don’t purchase generic socks, or at least not exclusively. There’s an impressive variety of socks on the market, produced by several dozen small- and medium-sized manufacturers. Spending a bit more on their socks is worth it, especially for travel. Look up “Quality Socks” in the dictionary and there could be a picture of a pair of Thoro Lite Running Mini Crews . 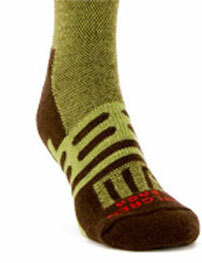 . . or a picture of Thoro Moderate Cushion Hiking Socks with Coolmax . . . or, now that we think about it, any of the offerings by Thoro. Thoro socks are well constructed (using environmentally friendly methods) and smartly designed. Looking for light running socks? Or warm hiking ones? Thoro socks are intuitively named by weight and suggested use. We also like that Thoro makes dress and casual socks—if you were to buy all of your socks from a single manufacturer mentioned in this review, Thoro would be that one. For travel that involves a lot of walking around, our favorite Thoro socks are in the Thoro Experia line. These socks have sculpted cushioning around the heals and forefoot—exactly where you need it most. Experia socks also feature a pad that protects the achilles tendon and a breathable frame that feels snug, but not tight, around your feet. I just don’t like things between my toes! is many people’s first reaction to toe socks. Spot Cool Stuff can’t help but think that the majority of those people are reacting to the concept of a toe sock, not the reality offered by Injinji. The company holds patents on—and has won awards for—their toe socks. Injinji socks don’t make your toes feel cramped. The exact opposite; for people who dislike wearing socks a pair of Injinjis is the next best thing to going barefoot. With your toes more free to move individually, your foot behaves more like it does in its sock-less state. We are fans of all Injinji toe socks except the offerings in their Outdoor Series. Especially cool is the Performance Midweight Toe Sock, which features lush cushioning underfoot while remaining breathable around the top and sides. 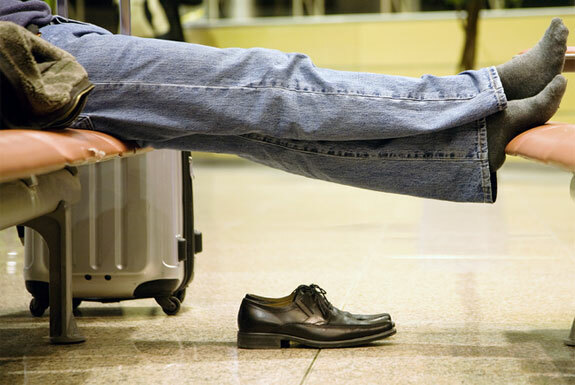 Injinji also makes compression socks that help prevent fatigue and greatly reduce foot and leg swelling during airplane travel. All Injinji toe socks offer excellent moisture wicking. The downside is that all Injinji toe socks take a bit more time and effort to put on than your typical non-toe socks. It’s time and effort Spot Cool Stuff finds well worth it. 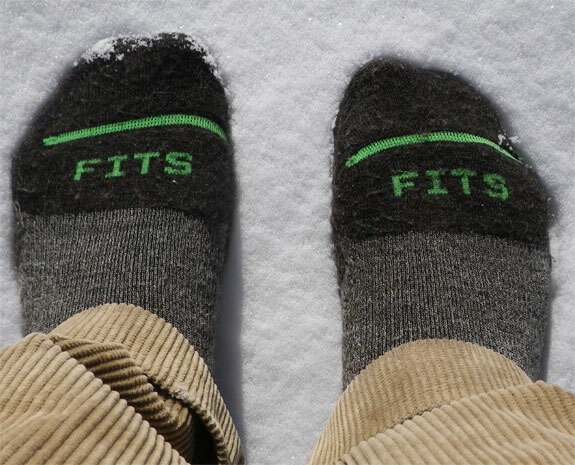 We tested our pair of FITS socks by walking out into the snow with him on—without shoes! Our feet did get a bit cold and wet. But we able to walk back inside and go about our business without our feet being uncomfortable. That’s the power of FITS and why we love them for cold weather walking. Note that by “cold weather walking” we don’t mean crossing the Siberian tundra or ascending K2. But FITS socks are ideal for, say, shopping at an outdoor market in Berlin on a crisp December day or walking around San Francisco on a crisp August one. When there’s a chill in the air FITS will keep it from your feet. 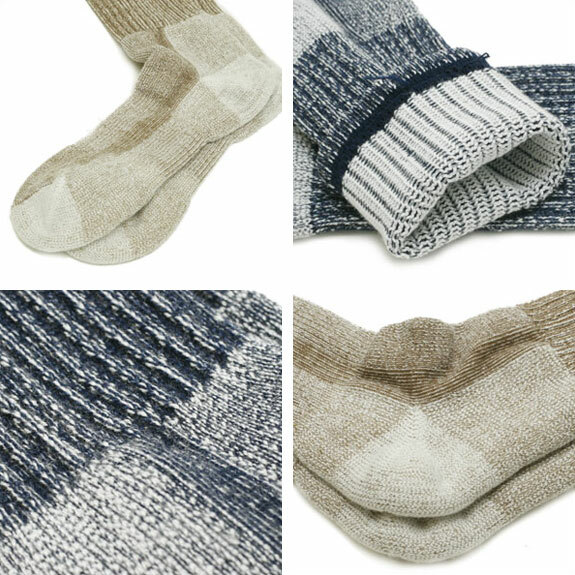 Some other aspects of FITS socks we like: their odor resistance (though not optimal, you can wear FITs for two consecutive days without washing them), their seamless design, the ultra-fine Merino wool from which they are made and the double welted top that prevents the sock from sliding down the leg. Water is the biggest enemy of sock comfort. Both outside wet conditions and inside sweaty conditions can infect socks with moisture. And since socks are usually enclosed by a shoe there’s no convenient place for that moisture to go. Dahlgren socks are superior when it comes to pulling moisture away from your feet. 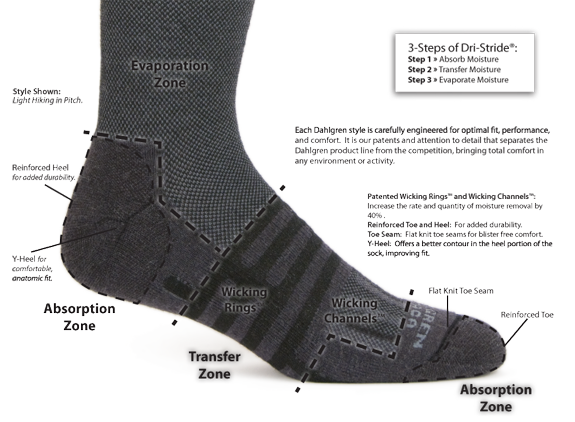 That is thanks to Dahgren’s ingenius Dri-Stride Technology, which divides each sock into different “zones” (although this division is not at all apparent when wearing the socks). Places where moisture is most likely to gather are absorption zones. Along the top of the foot is the wicking zone that moves the moisture to the evaporation zone that’s located at the top of the sock. In other words: Dahlgren socks literally remove water from your shoes—and do that better than any other socks. Spot Cool Stuff’s own view is that security fears while traveling are generally overblown. 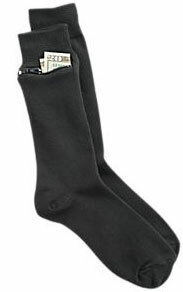 For those who disagree, National Geographic makes a pair of socks with a semi-hidden zippered pocket into which you can fit a few bills and a key. (A credit card will fit too, but might not bend around your ankle). These socks are also handy when you are heading out sans pockets and want some cash with you. 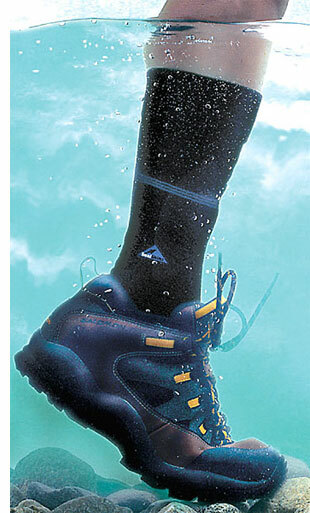 2) Socks that were pleasant to wear for prolonged periods but weren’t, in fact, waterproof. In our experience, the best of the mediocre lot of waterproof socks are made by SealSkinz (a company whose waterproof gloves we are big fans of). The SealSkinz Water Blocker features an in-cuff seal that manages to strike a good balance between comfort and water resistance in a way other socks did not. Depending on what water activity you are engaged in, you may want to consider getting a pair of Seirus Hyperlite Stormsocks Waterproof Socks. The name is a misnomer: These Seirus socks are NOT waterproof. They act more as a wetsuit for your feet, allowing water to flow in while also trapping a layer of warmth around your feet. That old saying “If you can’t beat em’, join em'” applies well to the task of waterproofing socks. Symmetry is a highly overrated quality in socks. And that’s why we love Mismatched Socks, made of recycled yarn in Vermont, USA. Mismatched Socks don’t have the high-tech features of the socks reviewed above, but sometimes you have to disregard practicality and dare to mismatch. Especially cute are the Mismatched Dragonfly baby socks. After reading this review post you are surely asking yourself After I upgrade to cool new socks what should I do with my old ratty ones? Our solution: Make sock puppets. 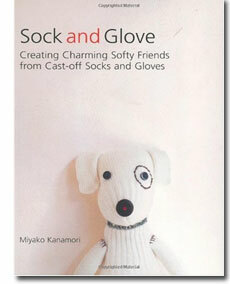 The excellent guidebook Sock and Glove: Creating Charming Softy Friends from Cast-Off Socks and Gloves gives all manner of useful tips and creative ideas to try. You’ll have fun making sock puppets. Your kids will love them. Your dogs will chew them. I really like Kentwool socks. Interesting. I tried some travel socks from Tilly’s and was really disappointed in them – found my regular socks more comfortable and dried just as quickly. Always wear black socks but some interesting choices here to check out. Whenever I am going to country tour, I use either CEP or Dahlgren. Also Sigvaris and Jobst has their socks for travel purposes. Yes, Nylon and Spandex contains travel socks is more comfortable than wool based one. Ha, I’m one of those people whose feet are always cold. I don’t know about those toe socks, they might bother the sensitive spaces between my toes. However, those cold weather socks? I’d wear them even here in Southern California! And the mismatched socks are adorable. Great list! 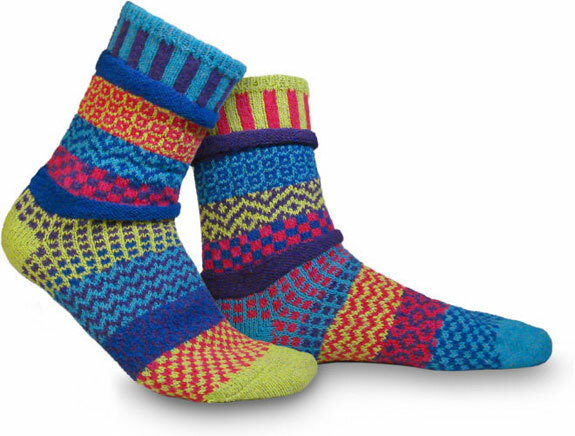 I’m pretty fond of Smart Wool socks, and I love the Life is Good sleep socks (I just gave a pair of the latter as a little gift, and my recipient, who always has cold feet, whipped off her boots and immediately put on those cushy socks as we sat in a coffee house! :lol:). Smart Wools always seem to keep my feet warm and pretty dry, while the Life is Good sleep socks are great to keep your feet warm at night and take up less space in your suitcase than slippers. Great roundup of socks! I really like the Injinji myself – brings me back to my youth when I used to get those toe socks for Christmas every year! my feet are always cold, too. i love bridgedale socks. great article! I’m telling you, even if you’ve disliked other toe socks don’t pre-judge the ones from Injinji. That said, if I lived in southern Cali I might never wear socks of any sort.